London is calling. As some of you remembered I have been to London for Fashion Week. During my trip I discovered the vegan restaurant Vantra, which I will proudly share with you in today's cook for me Sunday.. When it comes to the topic vegan nutrition, everyone likes to claim that raw salad is the only option. Especially when being on travel all of us vegan friends have coped with the typical side dish salad. Just in the center, directly on Oxford Street one can find Vantra. This vegan restaurant is not only a hot spot for vegans, also celebrities and meat eaters, so as vegetarians enjoy the delicious healthy kitchen. "Vantra Vitao has been creating forward thinking and flavoursome gourmet food and drink for over twelve years. Our passions lie with nutrient rich ingredients and so all of our meals are hand prepared, using only fresh produce. We place importance on food that is beneficial for body, mind and planet, providing customers with local, seasonal and organic ingredients." Vantra Vitao’s mission is to promote a nutritious vegan lifestyle that is delicious and nutritious, also accessible and sociable. "We at Vantra Vitao wish to demonstrate how easy, approachable and satisfying it can be to eat well." With a wide range of offered dishes and many pages in the menu, everyone can find the matching dish. Also all kind of allergies are respected and suitable with the offered dishes. Beside a wide menu, one can also order fresh juice at the bar, which is heavenly tasty and worth to give it a try." "Join us daily between 11:30 – 22:30 to enjoy a wide variety of delicious food at our buffet, whilst gaining a valuable insight into veganism and an optimum nutritional experience." I visited the restaurant 8:30PM and enjoyed some dished from the menu, so as a selection of the open buffet, which is changed often to keep the food fresh and warm. 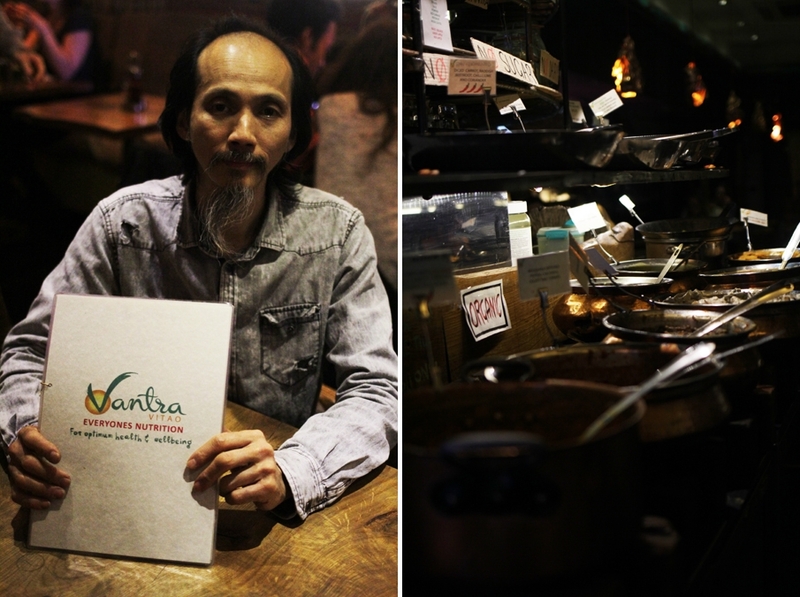 When being in London next time, don't forget to visit Vantra, 25-27 Oxford Street London W1D , and enjoy the healthy and energy boosting food. make sure to stop there!